5 YR @ 3.14%* • Line of Credit • Business Loans *O.A.C. • 2018 Excellence in Agriculture Award Winner: Heidi Farms (Oeggerli Family) Heidi Farms Inc., operated by the Oeggerli family in Bainsville, was purchased in 1971 – since then the farm has expanded and improved year after year. CanWest DHI and Valacta recently recognized excellence in dairy herd management. Listed at the top of the Ontario list was Heidi Farms. With over 300 commercial dairy cows and 700 acres of land, the Oeggerli family has their work cut out for them and have certainly put South Glengarry on the agricultural map! • 2018 Entrepreneur of the Year Award – Sponsored by RC Holdings Winner: Shelia Cecereau (About Thyme) About Thyme was founded in 2013 as a passion project by Sheila Cecereu, who holds a certificate in Nutritional Counseling and a very strong culinary talent. After recognizing the need for healthy and convenient meals in the community, the company developed a mission to offer homemade, “nutrilicious” meals to those who are on the go. What started as a home delivery food business later evolved into a centralized storefront when Sheila partnered with Lancaster’s Épicerie Henderson’s Grocery in 2017. Since its inception, About Thyme has been committed to the betterment of the Township through health and nutrition. • 2018 Citizen of the Year Award Winner: Mary Regan Mary served as president of the Williamstown Green Thumbs Horticultural Society from 2010 to 2014. She was instrumental in installing the bridge boxes and beautification of the Williamstown Fair’s bicentennial. Mary is a board member at the Nor’Westers Loyalist Museum and is co-president of the St. Mary’s Guild, fundraising for many charitable causes. Mary is an engaged citizen who serves others with joy, passion and empathy. • 2018 Business of the Year Award Sponsored by Rozon Insurance Winner: Roger’s Marina (Nancy & Yves Struthers) Roger’s Marina has been owned and operated by the Struthers family since its inception. The current owners, Nancy and Yves Struthers, have developed a solid business plan to upgrade the amenities at the marina, turning it into a premier location for their customers. Under their ownership, there have been upgrades to the docks, with the marina now featuring 120 open boat slips and 30 boat houses. In the fall of 2018, Nancy and Yves constructed a new state of the art shop and sales facility. Roger’s Marina is a one stop shop for all boating needs, with Nancy and Yves committed to giving their customers a positive experience. • 2018 Youth Merit Award Winner: Keean McDonell Keean McDonell is a student at Char-Lan District High School who is described as an intelligent, conscientious, hardworking young man who is also involved with extra-curricular activities while maintain academic excellence. Keean volunteers at two local old age homes and over the last 2 years he has spent countless hours serving and cleaning up in the kitchen, helping organize activities and socializing with the seniors. • Special Business Achievement Awards Winner: Rob McIntosh, Fine China (40 Years) Winner: South Branch Garage (40 Years) Winner: Roger’s Marina (65 Years) The Township of South Glengarry extends congratulations to all award recipients! For more information, contact Joanne Haley, General Manager of Community Services 613-347-1166. • 2018 Community Service Award Winner: Martintown Mill Preservation Society The Martintown Grist Mill is 143 years old and has recently been reinvented through fun, education and community, thanks to the dedication of the Martintown Mill Preservation Society. The group works hard to preserve the mill structure, making it the focal point of various community events year round. One example of this organization’s dedication to the community is the annual Halloween celebration at the Mill. Due to the dedication of many volunteers, the event draws approximately 500 attendees. The care of the Martintown Mill Preservation Society has turned the mill into a sustainable tourist attraction and community centre. Dissolved Solids in Cristill Rock water is effectively zero (0.1PPM-0.4PPM). As a comparison, tap water in Cornwall has 146PPM on average. 8. Cristill Rock follows the Hazard Analysis and Critical Control Point (HACCP) and good Manufacture Practice (GMP) guidelines. 9. Cristill Rock water is tested daily in house. Weekly, a water sample is sent to an independent lab for testing and annually, Cristill Rock plant is inspected by the National Sanitation Foundation (NSF). Cristill Rock, located at 1140 Brookdale Ave. In Cornwall, is family owned and operated. They offer over 400 brands of coffee in addition to their water services, which includes a refilling station where customers can refill their 18L bottles 24/7. ALL PRICES IN EFFECT THURSDAY, APRIL 11 TO WEDNESDAY, APRIL 17, 2019 UNLESS OTHERWISE STATED. Prices of products that feature the M&M Food Market Rewards Special logo are exclusive to members of the M&M Food Market Rewards program. Simply present your membership card, or sign up for a free membership in store or online, to take advantage of these exclusive offers. M&M Food Market Express and other non-traditional stores offer a limited range of products; therefore special pricing and promotions are not valid at M&M Food Market Express or other non-traditional stores. Call now and enjoy all the data you can use! Our Xtreme Promo is on! Students of North Dundas Choir at Kinsmen Music Festival on Thursday, April 4 (Shawna O’Neill/TC Media). From left, Chloe Whittaker and Caitlin McNaughton, Holy Trinity Students, protesting on Thursday, April 4 (Shawna O’Neill/TC Media). kitchen every Monday and Friday. “If it’s a holiday, or we’re not open, or it’s the weekend, I miss it (here). I really do miss it. I miss the team I am working with, the people who come in to eat. They always have a smile on their face, they are always happy and they appreciate it,” said Charbonneau. “There’s a big need (for volunteering) in the community,” she added. “For a lot of people, this might be their only meal for the day…sometimes, when it’s a Monday, they haven’t eaten all weekend.” Charbonneau reflected on how volunteering can lead to different opportunities, whether they be personal or professional. “They do it right from the heart. They’re amazing and very sincere with it all,” said Brown appreciatively. A Little time once a week can make a BIG impact! of Littles in our programs feel better about themselves and, of Littles have better school attendance. for making a difference together, in order to serve our community in the tradition of our founders, the Religious Hospitallers of St. Joseph. Our communities are better places thanks to you! During National Volunteer Week and throughout the entire year, Carefor Health & Community Services wishes to acknowledge and thank our amazing volunteers. 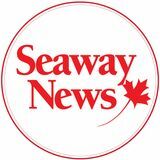 Seaway News welcomes letters to the editor. Letters should be no longer than 300 words and may be edited for clarity or length. Please send your letters by email to editorial@cornwallseawaynews.com or by mail to 501 Campbell Street, Unit 6, Cornwall, ON K6H 6X5. Please include your name, address and phone number. coach. TRIVIA This United Counties’ school took its name from the Algonquin word for meeting place. TRIVIA ANSWER Pernell-Karl Subban was born and raised in Toronto. His father, a retired school principal, and mother immigrated to Canada from Jamaica in the 1970s. HERE AND THERE To accommodate aging baby boomers, it might be time to rename some of the Sixties’ hits. How about Splish, Splash, I Was Havin’ a Flash”, On the Commode Again, It’s My Procedure and I’ll Cry If I Want To, Denture Queen, How Can You Mend a Broken Hip?, You Make Me Feel Like Napping, A Whiter Shade of Hair, Mrs. Brown You’ve Got a Lovely Walker, and Once, Twice, Three Times to the Bathroom. ... Remember when you had to crank a car window up and down and driver’s ed included learning hand signals. P FACTS’N’FIGURES In the 10-year period 1951-1960 St. Columban’s, the city’s oldest parish, had 1,916 baptisms, 618 marriages and 914 funerals. The number of funerals was down from the previous decade which had 1,011. AND THE BEAT GOES ON Kirk Douglas 102 (he was born Issur Danielovitch), Doris Day 97, Gina Lollobrigida 91, Clint Eastwood 88, Raquel Welch 78, rockers Keith Richards and Mick Jagger 75 (they just look 95). ONE FINAL THING “The key to being a good manager is keeping the people who hate me away from those who are still undecided.” - Legendary baseball manager Casey Stengel. His musings became know as “Stengelese”. Suggested servings. Limited quantity, while supplies last. Available in dining room at participating St-Hubert rotisseries only. ® Registered trademark of St-Hubert L.P., used under licence. © All rights reserved. SALVATION ARMY CORNWALL PASTAWITH-A-PURPOSE Saturday April 13th 5:00 pm. A benefit dinner for The Salvation Army Cornwall’s Mozambique and Malawi missions appeal. Tickets are $10.00 per person and are available at The Salvation Army Thrift Store (401 4th St W) or The Salvation Army church (500 York Street). Call 613.932.7515 for full details. SMART CITY TOASTMASTERS invites you to become a better communicator. Join us at St Lawrence College room M3520 on the 1st and 3rd Wednesday of every month at 6:45 pm. Small group allows you to get comfortable in practicing presentations, and grow your confidence. Remember, it is free for visitors. IF SOMONE’S DRINKING BOTHERS YOU call Al-Anon 613-937-4880 CORNWALL NEWCOMERS CLUB welcomes women who have moved to Cornwall and surrounding area in the last 4 years. Info: Eleanor 613-935-4916 or Marilyn 613-933-2966 to learn more about the club and its activities. CENTENNIAL CHOIR OF CORNWALL’S SPRING CONCERT RHAPSODY This 75 member choir will perform songs that will leave you in rhapsody for days. Enjoy the energy and zest of this choir on May 10 at 7:30 at Aultsville Theatre. Tickets are available from choir members, at the Lottery kiosk at Cornwall Square or at Home Hardware at Pitt and Thirteenth Street. FISH, CHIPS, AND WINGS RCAFA Wing 424, Water Street April 26. Live band - Billy Gabriel Band. No cover charge 7:00 to 11:00 pm COMMUNITY BINGO - every Thursday, Early Birds/Bonanza at 6:45pm, regular games at 7:15. St. Andrews Church Hall, St. Andrews West. Proceeds for hall renovations - sponsored by Knights of Columbus. Licence M783589 SPECIAL DRAMA THE LIVING LORD’S SUPPER at Cornwall Wesleyan Church on Psalm Sunday ( April 14th ) at 10 am followed by a potluck Seder meal. Info. Call 613-916-9166 ANNIVERSARY BBQ - St. John’s Presbyterian Church on Sat., May 4th from 5-7 pm. Steak or chicken and trimmings. Tickets 613-932-8693 or 613-537-8290. SPRING LUNCHEON & BAKE SALE Ingleside-Newington United Church, Ingleside. April 13 from 11:30-1 pm. Adults $10, children $5 (ages 5-12). Everyone welcome ALZHEIMER SOCIETY– IG WEALTH MANAGEMENT WALK FOR ALZHEIMER’S in Cornwall is Saturday, May 4th, 9–11:30 AM at the Benson Centre. Join us for fun, exercise, music, prizes and more! Registration is open for individuals, teams and volunteers at www. walkforalzheimers.ca or call Jennifer at 613932-4914 ext 206. Together, we can make memories matter! PAINT NIGHT AT MONKLAND REC CENTRE 17337 Hwy 43 & Hwy 138 Friday, Apr.12th, 7–9 pm. Call Carol at 613-330-6647. Let’s Have Some Fun!!! SEAWAY WINDS CONCERT BAND’S MAY CONCERT “SHOWTIME!” will be held at Aultsville Theatre May 4th at 7:30pm. Jazz & Pop vocal artist, Katie Ditschun, is the featured soloist. Tickets are available at Cornwall Square, 2nd floor Admin. Office, Mon-Fri, 8:30am 5:00pm or at the door before the concert. OSGA 55+ DISTRICT 8 SUMMER EVENTS Thurs., Apr.11 @1 pm Cribbage open doubles, Senior Centre Cornwall 613-764-1509. Fri. Apr 12 30 am 8 ball Billiards (men,women) Rack’Em Up Cornwall 613-703-9180. Mon.Apr 29 @1 pm Carpet Bowling, open doubles, Matilda Hall Dixon’s Corners 613-652-4130. Please register with the Convenor one week in advance. All participants who are 55 years of age and older and live in SDG, Prescott, Russell and Akwesasne are eligible. An annual membership fee applies to participate in all events for the year. GOOD FRIDAY FISH ‘N’ CHIPS (HADDOCK) April 19th, 4-7 PM Knights of Columbus 755, 205 Amelia St. (Doors open at 3 PM) Everyone Welcome! CORNWALL WESLEYAN CHURCH invites you to our Sunday Morning Worship Service at 10:00 a.m. Kids Konnect Church for children ages 4 – 12 years. Nursery is also available. Bible Study Thursdays at 6:30 p.m. Men’s Fellowship Meeting at 8:30 a.m. the first Saturday of the Month. For further activities refer to www.cornw a l l we s l e y a n c h u rc h . o n . c a o r c a l l 613-936-9166. DOES FOOD CONTROL YOUR LIFE? Do you constantly diet, starve, binge or purge? Do you hate your body? Do you eat and feel guilty? STOP hurting yourself with food. There is a place for you! We meet every Monday evening at 6:30pm at Wesleyan Church, 780 Sydney, Cornwall. You are not alone. Contact 613 6629979 or oa.cornwall@gmail.com VOLUNTEER DRIVERS NEEDED CANADIAN CANCER SOCIETY needed in Cornwall & district to provide cancer patients transportation to their medical appointments. The Wheels of Hope program ensures that volunteer drivers are trained and supported in addition to reimbursing them for mileage. Interested in becoming a volunteer driver? Please contact Linda Rodgers Email: linda.rodgers@ontario.cancer.ca or call 613-932-1283 CASINO TRIP to Lac Leamy Casino, Hull on Sat., April 27, bus departs at 9:30 am. Info: 613932-6534. Proceeds toward St. Joseph’s Continuing Care Centre. CORNWALL COMFORT QUILTS hand made for and given to Cancer patients. For more info call: Nicole 613 935-5593, Laura 613 936-2179, Anne 613 932-7084, Anne 250 4281637. Located at The Care Centre, 510 2nd St. E. Cornwall. ST. JOSEPH CONTINUING CARE CENTRE 2019 CASINO TRIPS April 27, Saturday, Lac Leamy (Hull)-depart 9:30. WANTED: ARTISTS, ARTISANS, VENDORS, AUTHORS AND ENTERTAINERS FOR THE MARTINTOWN MILL! The Grist mill will welcome the Public for the Strawberry Festival on June 22, and officially opens its doors to visitors from July 7 to Sept 15. If you wish to participate as an artist in any medium, as an artisan or vendor, if you wish to showcase your talents as an entertainer or an author, please contact Barb Bracken at jbracken81@gmail.com, or 613 347 2540, to arrange a date(s) or receive information. ALZHEIMER SOCIETY – MONTHLY SUPPORT GROUP meetings for families and for those living with dementia. Call 613 9324914 for times and locations (English and French). SeawaY community events READY, SET, SHOP AT THE RELAY RUMMAGE SALE Join the Relay teams and shop for a great cause, Saturday, May 4th from 8 am to 2 pm. Fine’s Home Hardware, 10 13th St. E. Every dollar raised goes towards Relay For Life and help the Canadian Cancer Society fund Canada’s most promising research and vital support services. WEDNESDAY AT THE MOVIES screens the Icelandic film Woman at War. Halla leads a double life as a passionate environmental activist secretly waging a one-woman-war on the local aluminum industry. Galaxy Cinema, April 17 at 7:30 pm. Tickets available at the door or Complex Box Office. FRIENDLY CIRCLE SENIORS CLUB VARIETY SHOW AND THEME NIGHT Friday May 10th 7-11PM. South Stormont Township Hall. Decorate you table and dress the part. You could win a prize. Table are welcome to bring their own themed snacks. Cash bar. Prizes for best Entertainer, & Costumes/Table. For info and tickets call 613-534-5252 Also looking for comedians, musicians, magicians etc. 613-362-4273 INDOOR GARAGE & BAKE SALE Saturday, May 4th 9AM-1PM. Cornwall Pentecostal Church, 208 Second St. E. (at Amelia St.) 613937-3737. Lots of items priced to sell. was raised in support of Corn Community Hospital wall ….right here at home! Cornwall Community Hospital Foundation would like to thank Corus Entertainment, our sponsors, generous donors and volunteers. ROAST BEEF DINNER Organized by The Lost Villages Lions Club. Wednesday Apr. 17th, 4-7pm. South Stormont Community Hall. 2 Milles Roch Rd Long Sault Roast Beef,Mashed potatoes, vegetables, bun and desserts(various pies),Tea and Coffee. Info: 613-577-1808. GIANT GARAGE AND BAKE SALE Saturday Apr. 27th, 8AM-2PM. Organized by Filles d’Isabelle Notre-Dame-des-Saints-Martyrs. Sainte-Thérèsede-Lisieux Parish Hall, 1304 Lisieux St. THE GENDER ILLUSIONS RCAFA Wing 424Water Street, May 5th. Limited tickets at Wing RELAY FOR LIFE Calling all secret agents for a mission to support cancer research and vital support services at the Canadian Cancer Society’s Relay For Life, Friday, June 7th from 6 pm to 12 midnight at the Maxville Fair Grounds. The James Bond themed event will include the opening survivors walk, fun activities including a casino royale along with the moving luminary ceremony. Community is bigger than cancer so register or donate today at RelayForLlife.ca or call 613-932-1283. 3RD ANNUAL EASTER EGG HUNT Saturday,Apr. 20th. 10:30am-2pm at the Arnold Bethune Memorial Park, Long Sault . Hot Dogs and Hamburgers. The Easter Bunny will be there too. Sponsored by Ingleside Long Sault Lost Villages Lions Club. Info: 613-577-0818 ADOPTION WEEKEND AND FUNDRAISER AT 2 LOCATIONS Saturday & Sunday, Apr. 27-28th. At Pet Valu Eastcourt Mall -1380 2nd St. E. & Pet Valu 12438 Stormont, Dundas and Glengarry County Road 2, Morrisburg. Bake sale 10 am to 3:30 on Saturday only. Nail trimming only available that same day at Pet Valu in Cornwall. We are also selling tickets for a Paint Day. Proceeds going to KNOT FURGOTTEN CAT RESCUE. More info can be found on our Facebook page and Kijiji. VESAKHI IS THE CELEBRATION OF THE BIRTH OF THE KHALSA by the tenth Sikh Guru in 1699. it is also the celebration of harvest in April in agricultural communities in India. 1699 – 2019 SRI GURU SINGH SABHA Join us at 108 Anthony St.,Saturday 13th April. Prayers and Langgar will be served. 6pm. All are welcome. SEXUAL ASSAULT SUPPORT SERVICES SDG&A Healing Art Group, every Friday from 1-4pm at OBO Studios at 204 Second St. W. Women’s Empowerment Series at SASS – Thursday Apr. 11, 18, 25 6:30-8:30pm at SASS (registration required). SEAWAY VALLEY COMMUNITY HEALTH CENTRE IS SEEKING VOLUNTEERS to assist with cooking and nutrition programs in Cornwall and Dundas County. Knowledge and experience cooking healthy recipes is necessary. Be part of a fun, interactive team that will improve the health of our community. For more information, call Corrie: 613-930-4892 ext. 152 THE CORNWALL NAVY CLUB 30 Sixth St E. across from Giant Tiger serves supper every THURSDAY at 5 PM followed by Georgie’s Karaoke from 6-9PM. SATURDAYS from 3-7 pm karaoke with Georgie. SUNDAYS breakfast served from 8 am-noon. Everyone welcome. H a l l re nt a l s fo r a l l o cc a s i o n s. Info:613-938-0285 SPRING TEA sponsored by St. Peter’s C.W.L. on Wed., April 24 from 1-2:30 pm. Sandwiches, beverages, white elephant table, bake table. All welcome. *all prices +HST & lic. Du théâtre pour mieux lire et écrire! pour les adultes dont le système immunitaire est compromis. » Le vaccin est sûr et efficace pour empêcher d’attraper et de propager la rougeole. L’immunisation contre la rougeole est généralement administrée aux enfants âgés de 12 mois qui reçoivent ensuite une dose de rappel entre 4 et 6 ans. Les nourrissons de 6 à 12 mois peuvent être vaccinés s’ils voyagent dans des zones de flambée ou s’ils ont été exposés à un cas de rougeole. Pour le moment, aucun changement n’a été apporté à la recommandation actuelle d’immunisation des nourrissons puisqu’une flambée n’a pas été déclarée dans la région ni à Ottawa. Le vaccin contre la rougeole est disponible sans frais chez votre fournisseur de soins de santé, et aussi sur rendez-vous au BSEO en appelant au 613-933-1375 ou au 1 800 2677120. Pour de plus amples renseignements sur la rougeole et sur l’immunisation contre la rougeole, visitez https://www.ontario.ca/fr/ page/propos-de-la-rougeole. Curiosity is a useful tool, Aries. Keep a handle on it this Reach out to your to friends this week and ask them for week. Do not go delving into situations that do not involve advice on your current situation, Libra. They know you you, or you could end up in trouble. well enough and may have some important insight. Taurus, if a certain person’s boastfulness is causing concern, you may need to speak up or simply avoid that person for the time being. He or she may just be blowing off steam. Scorpio your creativity is easily channeled this week and you are bound to surround yourself with others who are eager to brainstorm ideas. This can prove beneficial. You have set goals and your feet are firmly planted on the Gemini, save yourself a lot of frustration and accept the ground. These are assets that will serve you well, and way things are right now. Focus on the positives in your others will soon look to you for inspiration. CAPRICORN – Dec 22/Jan 20 life and count your many blessings. CANCER – Jun 22/Jul 22 Try a different approach if you want to see results, The universe has an important lesson to teach you, Cancer. Capricorn. Doing the same thing over and over again It involves giving up a little bit of control so you can benefit hasn’t worked for you thus far as it pertains to your in unknown ways. This is challenging, but worth it. relationship. Leo, think twice before you commit to any projects or Take the scenic route if you are going on a trip, Aquarius. confirm appointments with others. You have to have all of Getting sidetracked is the goal this time around, and you the details worked out in advance before you can proceed. can wander off to parts unknown. Virgo, if relationship issues are confusing you, it might be Support a friend who needs a strong shoulder to lean on, the right time to distance yourself and go it alone for a little Pisces. This person isn’t likely to ask for help, so reach while. This will help you get your bearings. out. Ask your call centre agent today! to our Advertisers : please check your ad the first day it runs, if you find an error call us immediately. in the event that an error occurs, our responsability is limited exclusively to the charge for the first week of publication of your ad. All forms of discrimination are illegal. BuNGAlow IN oNE oF thE MoSt dESIREd NEIGhBouRhoodS IN thE CItY! SOLD MARVElouS 2 + 1 BEdRooM BuNGAlow IN thE pREStIGIouS ChASE MEAdowS SuBdIVISIoN. SpACIouS 3 BEdRooM towN hoME IN A dESIREd AREA. Contact me for a complimentary market evaluation! SOLD BricK BungaloW - great neighBourhood! LET ME HELP YOU SELL YOUR HOME FAST AND FOR TOP DOLLAR! AsphAlt lAbourers/ trAffic control persons/ shuttle buggy operAtor Cornwall Gravel Co. ltd.
(1126678) Good size 113x134 lot.. High traffic area. Corner of Marleau & Lochiel. Permitted Uses for Hwy Comm. on file. (1122695) Exquisite Waterfront! 3 Bdrm brick bung, 1850 sq.ft., fin rec, rm 2 frpls, dbl garage. Very well-maint Ranch-style bung, dbl att garage, large landscaped yard with pond & beautiful flower beds. (1140429) Very well insul 3 bdrm home built on a slab. Short drive to West Island. (1134217) 1395 sq.ft. bung on private one acre lot. (1141938) Updated bung 2 bdrm bung in Bayview Estates. (1140506) Approx. 2200 Sq.Ft., 4 bdrm, 2 bath home on a large country corner lot with many great updates. (1126138) Unique unit in prime downtown location. Many numerous features & possibilities. (1138678) Great Opportunity to build your “Dream Home” or Investor to build a 4-Plex. (1143851) Charming country home on a large lot. Endless possibilities. (1134688) 3 Bdrm bung just on “The Fringe”. The best of both worlds, country living, min to the City. Great place to raise a family. (1141877) Great location. High traffic area. Well-established business with Post Office, Video Rentals, ATM, Lotto Machine. Extensively renovated. (1136545) 2 Bdrm front & back units. Rec gas furnaces &water htrs. Tenants pay utl. 20327 ANDREA CR, LANCASTER - $229,987 (1136310) Beautiful open concept semis, gleaming hdwd frs. nOTICE: It is our wish to serve you through the classifieds, however, Seaway News can’t possibly verify the legitimacy of all ads. dO nOT SEnd MOnEy OR gIVE yOUR CREdIT CARd nUMBER to any company offering employment. Legitimate firms do not charge potential employees for a job. Opportunities to earn money at home by assembling products, etc. should be examined carefully. Check references of these companies. Do not send money or give your credit card number until you are satisfied you are going to get what you bargained for. Let the buyer beware. PUBLISHER’S LIABILITy fOR ERROR: The publisher shall not be liable for slight changes or typographical errors that do not lessen the value of an advertisement. The publisher’s liability for other errors or omissions in connection with any advertisement is strictly limited to publication of the advertisement in any subsequent issue or the refund of any monies paid for the advertisement. Toute reproduction des annonces ou informations, en tout ou en partie, de façon officielle ou non-officielle, est interdite sans la permission écrite de l’éditeur. AduLt CoMMuNitY oF CReg QuAY (1134361) Move-in-cond 3 bdrm, 2 bath home, 4-season sunrm, rec rm. Come & enjoy all amenities this Community offers. Responsabilité de l’éditeur en matière de réclame : l’éditeur ne peut être tenu responsable des changements mineurs ou des erreurs typographiques qui n’affectent pas la valeur d’une réclame. En ce qui concerne les autres erreurs, sa responsabilité se limite strictement à la publication de l’annonce dans une édition subséquente ou le remboursement des frais de publication. The views of contributing writers are not necessarily the viewpoints of this newspaper or its publishers. INDOOR house sale. SAVE THE DATE, Saturday, April 13th, from 8a.m.-3p.m., 1320 Lancaster Crescent, Cornwall. We are are downsizing. A little of this and that. Smoke and petfree home, cash only and pickup only. 16 BALDWIN ST, upr, 1 bdrm, f/s $675 incl. 3211-B CADEB, 1 bdrm, lower unit, f/s $950. Incl. 57-B LEFEBVRE, upst 1+bdrm, no appl $575+gas/elect or $675 incl. VALECREST, lower, bachelor, furnished, $550 incl. 3053 PITT ST, lower, 1 bdrm, wifi incl, no parking $695 incl. Cornwall man charged in historical sexual assault of minor CORNWALL, Ontario – A 51-year-old Cornwall man was arrested on April 1, 2019 and charged with sexual assault, invitation to sexual touching, sexual interference, and sexual exploitation. It is alleged between 2005-2012, the man sexually assaulted his step-daughter while she was between the ages of 11-17. Police were contacted and an investigation ensued. On April 1, 2019 the man attended police headquarters to deal with the matter. He was taken into custody, charged accordingly and released to appear in court on April 25, 2019. His name was not released as it would identify the victim in the matter. Four arrested after drug bust on Carleton St. In loving memory of a dear husband and father who left us five years ago on April 10, 2014. Sadly missed along life’s way, Quietly remembered every day, No longer in our life to share, But in our hearts, you’re always there. In my heart your memory lingers, Sweetly tender, fond and true, There is not a day my beautiful wife, that I do not think of you. May the winds of heaven blow softly, and whisper in your ear, How much I love and miss you, and wish that you were here. quantity of cocaine, a stolen laptop, a quantity of American currency, as well as a quantity of Canadian currency in an amount over $5,000 was located in the residence. As a result of the investigation, four people were taken into custody and charged as follows: Robert Kaufman, 58, of Cornwall: • Possession for the purpose of trafficking cocaine • Possession of property obtained by crime over $5,000 • Possession of property obtained by crime under $5,000 • Breach of undertaking (for failing to keep the peace) Chantal Ceasor, 46, of Cornwall: • Possession for the purpose of trafficking cocaine • Possession of property obtained by crime over $5,000 • Possession of property obtained by crime under $5,000 Megan Powless, 24, of Cornwall: • Personation x 2 (for falsely identifying herself to police twice during the investigation) • Breach of probation (for failing to keep the peace) It should be noted Megan Powless was also arrested on the strength of a warrant for failing to abide by her recognizance and probation throughout January 2019. Carmela Licursi, 38, of Cornwall: • Possession of cocaine Carmela Licursi and Chantal Ceasor were released to appear in court on May 9, 2019. Megan Powless and Robert Kaufman were both held for a bail hearing. In memory of my dear wife who passed away April 7, 2015. Death changes everything! Time changes nothing,… We still miss the sound of your voice, the wisdom in your advice, the stories of your life and just being in your presence. So, NO, time changes NOTHING, We miss you as much today as we did 10 years ago when you passed away. Beautiful 4 bedroom home for the growing family. Features 1834 sq.ft. above grade plus a finished basement. Many updates over the last 6 years including hardwood flooring in the living/dining and family rooms, all front facing windows and doors replaced, modern kitchen with island, furTodd Thompson* nace/central air/air exchanger 613-551-7908 replaced and a recent above ground pool. 1900 sq ft, 3 +1 bdrm, 3 bthrm, gas fireplace, C/A, Sunroom, fin bsmt, in ground pool & more. other as they say goodbye to each other and head back to freedom in the ocean. Her sister Shirley Zundell in Vermont is an avid birder and a naturalist. the ideal candidate is forward-thinking, innovative and flexible. Qualifications and Skills Master’s Degree in Library and Information Studies from an ALA accredited university. Equivalent education and experience will be considered in other areas where knowledge and performance of CEO competencies can be applied and demonstrated. •	A	minimum	of	five	(5)	years’	experience	in	senior	level	administration and management. •	Meets	CEO	Competencies	at	a	high	level	in	all	areas (please	see	full	position	profile). •	Possesses	knowledge	and	experience	working	with/in	a unionized environment. •	Familiarity	with	the	unique	and	diverse	needs	of	Cornwall	residents. •	Bilingualism	would	be	considered	an	asset. Qualified and interested candidates should submit their cover letter and resume to FortisOntario Human Resources no later than April 29, 2019 by e‐mail to krista.cummings@cornwallelectric.com. Please indicate “FAC‐SYS‐OPER” in the subject line. We thank all respondents for their interest, however, we will only respond to those selected for an interview. FortisOntario is committed to accommodating applicants with disabilities and will work with applicants requesting accommodation at any stage of the recruitment cycle. FortisOntario is an inclusive employer and committed to Accessibility. Qualified	candidates	are	invited	to	apply	electronically	by	submitting a cover letter and resume in word or .pdf format to Ceo Search Committee: board@library.cornwall.on.ca no later than 4:00 pm on april 29, 2019. Dana McLean Development Coordinator , City of Cornwall 100 Water Street , Cornwall ON K6H 6G4 dmclean@Cornwall.ca We thank all applicants for their interest, however, only those selected for interviews will be contacted. Information collected will be handled in accordance with the Municipal Freedom of Information and Protection of Privacy Act. Nous remercions tous les candidats pour l’intérêt porté au poste. Toutefois, nous ne communiquerons qu’avec les candidats sélectionnés pour une entrevue. Les renseignements recueillis seront traités conformément à la Loi sur l’accès à l’information municipale et la protection de la vie privée. Cornwall is a beautiful, safe and friendly growing community. Cornwall is located on the banks of the St. Lawrence River in Eastern Ontario, and has everything you need to enjoy an exceptional quality of life. With a small town feel, businesses and waterfront minutes away from your front door along with new opportunities awaiting around every corner. Cornwall is located near Kingston, the picturesque 1000 Islands and is a short drive from Ottawa/Montreal. Cornwall is an affordable place to live and a wonderful region to raise a family. what he is doing and we are excited to work with him…we are excited to see the people and to be a part of that set of shows,” said Taylor. Tickets to the show are available at Cornwall Civic Complex Box Office, online at CornwallComedyFestival.ca or by calling 613-938-9400. Book now to secure your spot for this season. Don’t get left out in the cold. I will pick up your papers, print the copy of your Tax Return, bring it back to you and efile it. Or you can see me in my office. Reader asks: will there ever be a Red Lobster Cat missing since Feb. 28, Fifth St. W. and Augustus area, orange, yellow, friendly. Was in Cornwall? seen on Facebook. Lost his way home. Please On April 7th, we had a fundraiser at Freshco call 613-933-0127. to raise money for Scleroderma, which my Jane in Bonville (the constant wonderer), 8-year-old was diagnosed with last year. My 12 was wondering why car makers do not put year old has spent the last 3 months making those little line defrosters on front windows like rainbow looms bracelets with the intent of sellon the back windows. If they can put a man on ing these and raising money for the sclerothe moon, I’m sure they can configure how to do derma foundation., as there is no cure. A friend posted this event on Facebook and it went that without blocking vision. around like wildfire. There was an overwhelmThe Ford government wants to change the ing turnout at Freshco and we raised $1500!!! It slogan on license plates to “Open for business”. moved me to tears at the generosity and care of It doesn’t do it for me personally, and I see no this community. Thank you to everyone who positive impact from this change at all. Maybe if came and donated. Love the Maclennans. he wants to change the slogan, he should get The Glen Nevis senior women’s soccer team some feedback from the public. I’m not against it, but I think the new slogan should be some- has taken the crown in the Glengarry Soccer thing that represents everyone instead of being League playoffs with Ashton MacDonald and an ad for Doug Ford and his rich donor friends. Katie McDougald scoring for Glen Nevis in their final game against Dunvegan. Glengarry District High School is presenting MAMMA MIA! the musical April 25-27 at 7:00pm. Pictured are some of the cast members from the production. Changing the license plate slogan, redesigning the Trillium logo, getting rid of the front license plate, are these really the top issues facing the province of Ontario right now? SEAWAY NEWS PET CORNER Scotiabank presented a cheque to the United Way of SD&G on April 2 for $20,000. Pictured are Andrew Donihee- Chair of the Board of Directors United Way/Centraide of SDG, Daniel Brunet-Branch Manager & Mutual Funds Representative Scotiabank Brookdale Centre, and Stephanie Lalonde -United Way Campaign & Communication Coordinator. This is Danny Lion. He appeared in our Pet Corner 11 years ago. Needless to say he’s grown a little bit. Danny is now 22lbs of kitty but a beautiful gentle lion. He is cared for by Dave and Line. Bring in or email your favourite pet photo along with a small caption and we’ll publish it so all our readers can enjoy it, too! 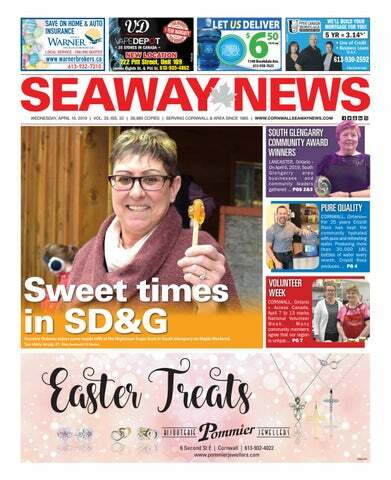 Place your ‘Let’s Celebrate’ in Seaway News for a chance to win a Frozen Celebration Cake compliments of Dairy Queen Cornwall and Seaway News. All Celebrate ads will be entered into the draw. One (1) weekly winner. Coupon to be picked up at Seaway News. The 2019 National Broomball Championship will be held in Cornwall! The games begin on Wednesday, April 10th. The medal rounds start Friday, April 12th. April 14 enjoy Dinner with the Spirits at Table 21 (157 Pitt Street) Cornwall.It will be an out-of-thisworld evening at Dinner with the Spirits at Table 21! Psychic and clairvoyant Patty Mac delivers messages from the spiritual world and 3-course meal will be served during the event. The event starts at 6 pm. Tickets are on sale at Truffles Burger Bar (155 Pitt Street) – 65$/ person (meal & reading included). Enjoy classical organ music in a divine setting with Nativité Recitals. The performance will be held on Sunday, April 14 at 2:30 pm at Nativité Co-Cathedral (220 Montreal Road) featuring the talented Laura Akmene. Admission is free with a suggested donation of $10. Seaway Valley Wrestling returns with High Impact on April 20 at the Nav Centre. From Impact! Wrestling, “The Machine” Brian Cage makes his SVW debut against the fan favourite“born & bred for combat”Stu Grayson. Tickets are on sale at Fantasy Realm, 227 Pitt Street, in Downtown Cornwall. Team Dupuis, headed by Skip Matt Dupuis won bronze at the Travellers Curling Cup and were invited to sign the City of Cornwall’s Book of Recognition at the last Cornwall Council meeting. On March 29, students gathered in the Williamstown Rec. Centre for the 25th annual memorial game in honour of Jimmy Hill. Hill was a recent graduate of Char-Lan DHS when he tragically passed away in an ATV accident in 1993. We are 11 years away from climate change being irreversible. Lowlying countries will be flooded creating a global immigration crisis. Are you happy with how your government is working to prevent this disaster? LET US DELIVER Only $6.50/ 18.9L jug Char-Lan District High School student Nicholas Oeggerli is pictured with his red ribbon and $500 bursary for St. Lawrence College after winning the individual carpentry event at the Skills Ontario Qualifying Competition. After a pathetic snow and ice removal this winter…isn’t it time the city swept our streets and sidewalks? Rheal Duchesne recently scored a 775 high triple at a recent Knights of Columbus bowling game. Way to go Rheal. I’m close frieds with 25 letters of the alphabet. I don’t know Y. Ever since I was a kid, I always wanted to be a mirror cleaner. It is just a job I can really see myself doing. Congratulations to Mary Regan, South Glengarry’s Citizen of the Year! Congratulations to Cornwall firefighter and former SD&G Highlander Kevin McHardy on receiving a commendation from the Commander of the Royal Canadian Navy and signing the City of Cornwall’s Book of Recognition. The 2019 Raisin River Canoe Race will be held on Sunday, April 14th in St. Andrew’s Ontario. All participants are welcome to join us 7 am at St. Andrews Parish Hall for a pre-race breakfast. Pre-register online at www. rrca.on.ca or in person between 9 am – 10:15 am at St. Andrew’s School. Please note, there is a $10/boat discount for students 18 and under if registered online. Dinner will be hosted from 1 pm – 6 pm by the Ladies of St. Mary’s Parish. The Char-Lan junior B Rebels held their annual awards banquet recently. Brennan Markell was recognized as this past seasons’ Most Valuable Player. Congratulations Brennan and to all of the other winners. A couple of measles cases have cropped up Congratulations to Michaela Moffat who in Ottawa. Just want to remind everyone to vacwon the STARskater of the Year award at the cinate your children. We do not need epidemics Char-Lan Skating Club’s recent end of the year like measle, tetanus and polio coming back. showcase. Cornwall, Ontario - community newspaper serving over 39,000 homes every week.